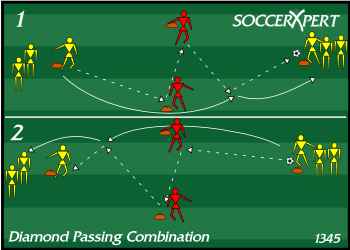 This soccer passing drill focuses on quick ball movement and combinations. Use this soccer combination drill to clean up first touch and tight passing, or spread it out and work on long passing. Set up 4 cones in the shape of an elongated diamond. Assign an all-time passer on each of the two cones where the points of the diamond are closest. Rotate these passers every 3-5 minutes. In our diagram, the passers are in red. Have the first player in line pass to one of the passers and overlap them. The passer that receives the first pass plays a first time ball into the other passer who then returns the ball to the player overlapping. The player then plays into the next player in line and the pattern repeats going the other direction. Focus on clean, crisp passing. Movement off the ball must be timed with the pass. The drill should flow with a continuous passing pattern. Focus on speeding up the combination play. Expand the distance between cones and play longer balls in the air.